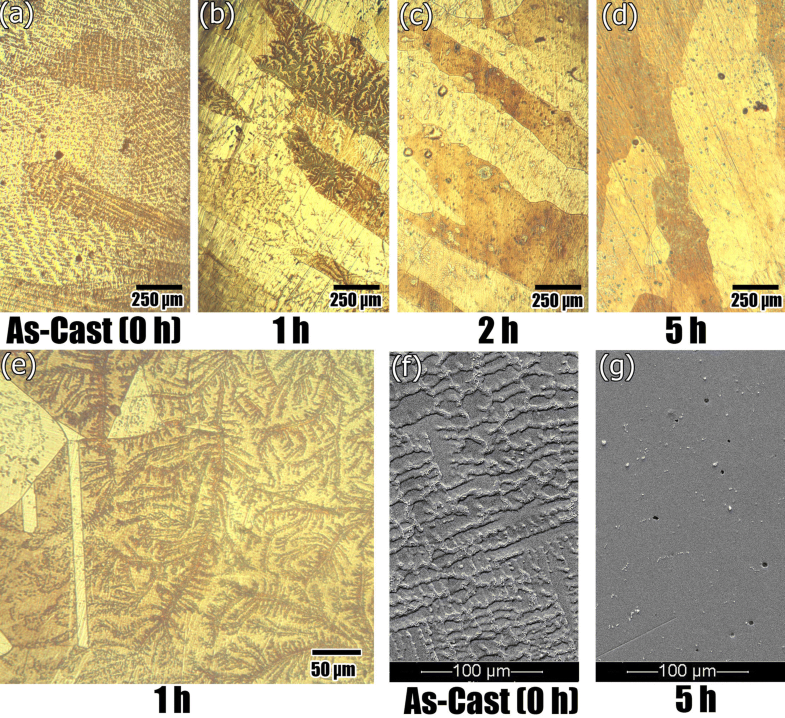 The as-cast structure and its evolution during homogenization heat treatment for a typical nickel-based superalloy (Inconel 718) were studied based on different etching methods. Unambiguous revealing of the dendritic microstructure and the austenite/Laves eutectic constituent in the interdendritic areas was considered as the basis for the judgment for appropriateness of the etching techniques. Both chemical etching and electrolytic etching techniques were taken into account. The waterless Kalling’s reagent number 2 was found to be a suitable etchant for revealing the macrostructure of the alloy. It was also concluded that electroetching by a H2SO4 solution and by a solution containing HCl, HNO3 and glycerol are appropriate for studying the as-cast and homogenized microstructures based on optical microscopy and scanning electron microscopy (SEM), respectively. The dissolution of the Laves phase, the coarsening of the grains, and the development of annealing twins during exposure at elevated temperatures were also briefly discussed. The severity of the segregated regions and the amount of the Laves phase in the solidified microstructure can be reduced by a high-temperature homogenization treatment, which facilitates the diffusion of the solute atoms.6, 7, 8 The incipient melting temperature (1160–1180 °C6, 7, 8) defines the upper bound for this purpose, and the homogenization temperature is considered close to it to accelerate the process. Accordingly, Liang et al.6 and Miao et al.7 have, respectively, considered homogenization temperatures of 1160 °C and 1140 °C. 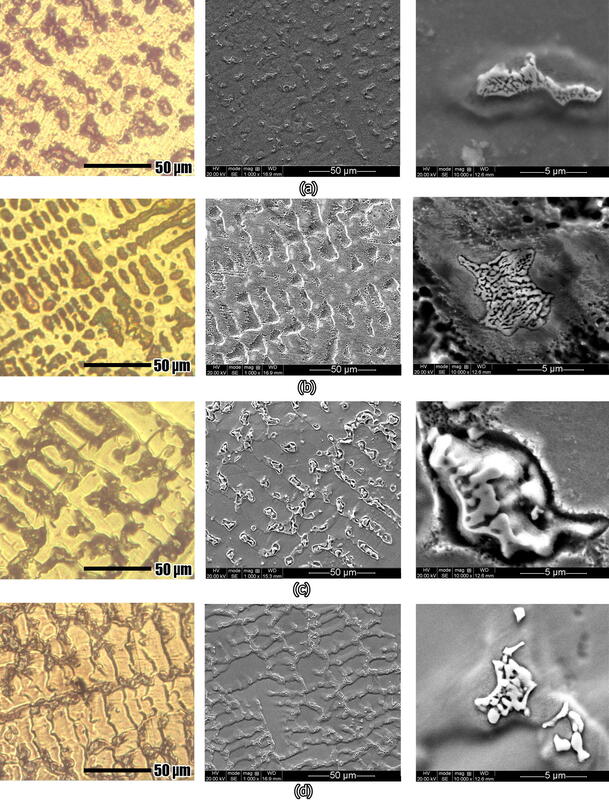 The first step in studying the as-cast and homogenized microstructures is revealing the segregated regions in the dendritic microstructure and observation of the Laves phase with enough contrast. As a result, several etchants are commonly used to reveal the as-cast microstructure of Inconel superalloys,7, 8, 9, 10, 11, 12, 13, 14, 15, 16, 17, 18, 19, 20, 21 which can be classified as four subgroups as described in Table 1. The advantages and limitations of these techniques are summarized in the same table. It can be deduced that several chemical etching and electrolytic etching solutions can be used to reveal the as-cast microstructure of Inconel 718 superalloy. 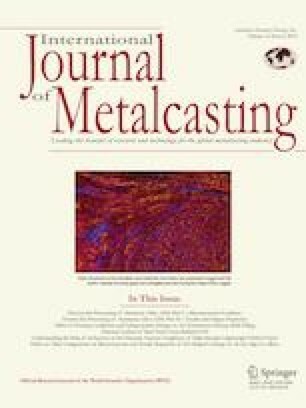 Based on the importance of the detrimental phases formed in the as-cast microstructure and amending their effects by homogenization heat treatment, optimization of etching techniques is a vital prerequisite and more works in this area might be advantageous. Moreover, the availability, price, simplicity, toxicity, and the possibility to store the solution are the issues of some of the mentioned etchants. Furthermore, since many of the published works deal with chemical etching, it is required to better evaluate the electrolytic etching of Inconel 718 superalloy. The present work aims to deal with these subjects. A forged Inconel 718 superalloy was vacuum arc remelted (VAR) and cast from the temperature of 1530 °C in a water-cooled copper mold (with dimensions of 6 × 2.5 × 1 cm3) to obtain a superalloy with chemical composition (wt%) of Ni–18.88Fe–17.61Cr–4.97Nb–2.85Mo–0.94Ti–0.57Al–0.02C. The homogenization treatment was performed by heating the alloy at the rate of 30 °C/s to the temperature of 1150 °C, holding for 1 h, 2 h, and 5 h at that temperature, and finally quenching in water. Samples from the center of the ingot were ground and polished for metallographic observations. An Olympus Vanox optical microscope (OM) and a Vega Tescan scanning electron microscope (SEM) equipped with energy-dispersive spectroscopy (EDS) were used for microstructural studies and elemental analysis. By consideration of the composition of the etchant used in previous works (Table 1), several etching solutions were considered and judged based on trial-and-error procedure. Based on these preliminary experiments, several etching solutions and electrolytic etching solutions were considered in this work as summarized in Table 2. Following is a detailed description of etching techniques presented in Table 2. 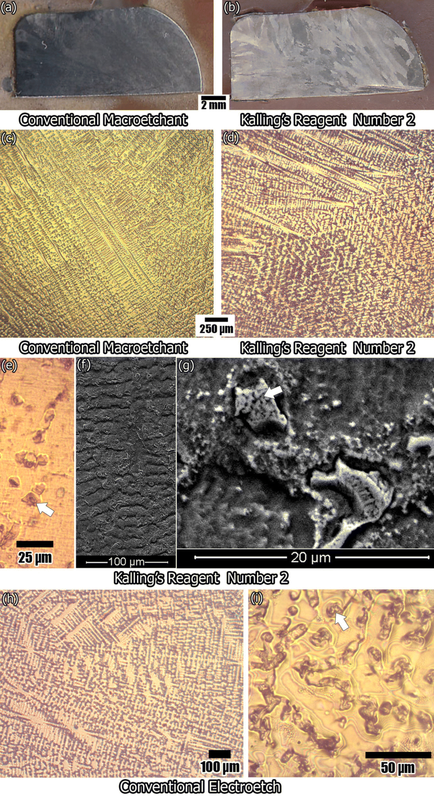 The macrostructure of the as-cast ingot as etched with the conventional macroetch (Table 1) is shown in Figure 1a, and an optical micrograph at a low magnification is shown in Figure 1c. It can be seen that this etching solution is not optimized for macroetching, while it can reveal the dendritic structure. Since the Kalling’s reagent is widely known as a general etchant for superalloys, its applicability for macroetching was analyzed as shown in Figure 1b. It can be seen that the Kalling’s reagent is able to reveal the as-cast macrostructure. Moreover, Figure 1d shows that this etchant is also applicable to reveal the dendritic structure. Its applicability was also analyzed at higher magnifications in Figure 1e, where the presence of another constituent within the segregated regions between dendrite arms is discernible. This can be better evaluated by observing SEM images (Figure 1f and g), where this constituent was characterized as the austenite/Laves eutectic structure. However, the Kalling’s reagent is not the best option to study the as-cast microstructure when its results are compared with those of the conventional electroetch (Table 1), where the dendritic structure with better contrast has been revealed (Figure 1h) and the presence of the Laves phase (Figure 1i) is much better distinguishable when compared with Figure 1e. As-cast structures of the Inconel 718 as revealed by the conventional etchants. The white arrows denote the austenite/Laves eutectic structure. To optimize the etching solution for better characterizing the dendritic structure and the presence of the Laves phase, the etching solutions based on the four groups described in "Introduction" section were evaluated and two modified etchants were obtained: Etch A and Etch B. The former is based on H2O2 and the latter is a mixture of acids. The results are shown in Figure 2. It can be seen in Figure 2a and b that Etch A is capable to reveal the details of the dendritic structure even better than the conventional electroetch (Figure 1h). However, the Laves phase cannot be distinguished. Even in the SEM image (Figure 2c), the Laves phase is not discernible. As-cast structures of the Inconel 718 as revealed by the modified chemical etchants. The white arrows denote the austenite/Laves eutectic structure. In spite of that, if the backscattered electron image (BSE) is considered, some white areas can be seen between dendrite arms (Figure 2d and also in Figure 2h). Based on the principals of SEM, there is a distinct BSE signal: atomic number or Z-contrast, in which composition determines image contrast and it arises from the dependence of the BSE emission coefficient (η) on target atomic number (Z). In multiphase specimens, Z and hence η vary from phase to phase such that the BSE image contains different intensities and contrasts, with higher Z phases appearing brighter. Therefore, the white areas in Figure 2d are expected to be related to a high Z phase. It is well known that the Laves phase contains much higher Nb and Mo compared with the surrounding matrix.5,6,25 Both of these elements have much higher atomic numbers (Z) compared with Ni, Fe and Cr as the principal elements. Therefore, these white areas should be related to the Laves phase. This is another method to reveal the Laves phase without attacking this phase, which is shown clearly in the present work. To provide evidence for the availability of high amount of Nb and Mo in the Laves phase, the EDS maps were considered based on the electroetch F (will be described later) as shown in Figure 3. It can be seen that the Laves phase is Nb and Mo rich. In fact, EDS point analysis showed that the weight percent of Nb and Mo in the Laves phase is, respectively, 24% and 3.3%. These values are much higher than the amounts of Nb and Mo in the alloy composition that are, respectively, 4.97% and 2.85%. EDS maps taken from the Laves phase. The results of the Etch B solution are shown in Figure 2e and f. It can be seen that the dendritic structure can be readily identified and the austenite/Laves eutectic can be seen unambiguously even in the optical images (much better than the conventional etchants shown in Figure 1). Based on Figure 1 and previous studies,7,10 it can be deduced that electrolytic etching brings about better results. Therefore, by modification of standard etchants, four electroetching solutions were obtained as described in "Characterization" section and Table 2. The results are shown in Figure 4. As-cast structures of the Inconel 718 as revealed by the modified electrolytic etchants. (a) Electroetch C. (b) Electroetch D. (c) Electroetch E. (d) Electroetch F.
Electroetch C is a modified version of the Lucas’s reagent (hydrochloric acid + zinc chloride),22 which has not been considered so far for revealing the microstructure of metallic materials. Figure 4a at different magnifications reveals that the electroetch C just reveals the austenite/Laves eutectic. Therefore, it is recommended for revealing the Laves phase, indisputably. However, it is not suitable for studying the dendritic structure. Electroetch D is based on HNO3 solution, and as shown in Figure 4b, it can decorate the dendritic structure. However, for revealing the austenite/Laves eutectic constituent, SEM images at high magnifications should be used. Figure 4c reveals that the electroetch E (based on H2SO4 solution) is one of the best ones for revealing both dendritic structure and the Laves phase (bright areas within dark interdendritic regions) based on optical microscopy. The presence of the austenite/Laves constituent can be clearly seen in the corresponding SEM image. Finally, electroetch F (Figure 4d) is based on the glycerol and it is one of the best etchants based on the SEM images, where the interdendritic segregated regions can be readily identified and the bright Laves phases within them have a very good contrast. Based on the results of "As-Cast State", "Optimization of the Chemical Etching and "Optimization of the Electrolytic Etching" sections, it can be concluded that electroetching based on the electroetch E (H2SO4 solution) and electroetch F (HCl + HNO3 + glycerol) are appropriate for studying the as-cast microstructure based on the optical microscopy and SEM, respectively. Moreover, the Kalling’s reagent number 2 is suitable for observing the macrostructures. 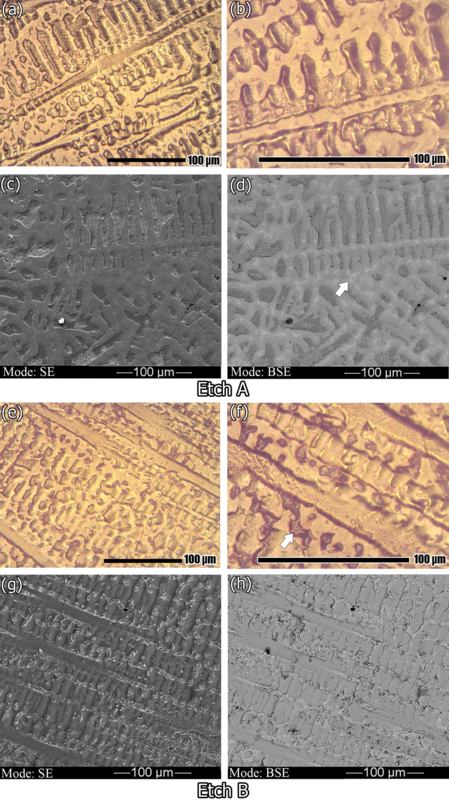 If only revealing the Laves phase is intended, Figure 4 reveals that the electroetch C is appropriate both in optical micrographs and SEM images. This fact is shown in Figure 5 based on the quantitative analysis of the austenite/Laves structure: 4.8 vol%, 4.6 vol%, 4.4 vol% and 4.1 vol% based on the optical micrographs of electroetch C, electroetch E, electroetch F and Waterless Kalling’s reagent, respectively. Since the austenite/Laves structure can be distinguished unambiguously based on electroetch C and the quantitative results of the electroetch C and electroetch E are consistent with each other, this electroetch can be recommended for this purpose. Optical micrographs used for quantitative analysis of the austenite/Laves constituent: the figures shown on the right side were used for quantitative analysis. Based on the abovementioned analysis, the results are summarized in Table 3, where the etchants are categorized as recommended, useful and not recommended. The effect of homogenization heat treatment at 1150 °C on the microstructure is shown in Figure 6. The low magnification images shown in Figure 6a, b, c, and d reveal that the dendritic microstructure tends to disappear and the grain size tends to increase by grain growth mechanism. Moreover, Figure 6e shows the appearance of annealing twins during homogenization treatment, which is a common phenomenon during annealing of Inconel 718 and other FCC alloys.26, 27, 28 Figure 6f and g (electroetch F) reveal that the homogenization treatment results in the disappearance of the segregated areas and dissolution of the Laves phase. Homogenized structures obtained by holding the alloy at 1150 °C for different soaking times as etched based on (a–e) Kalling’s reagent number 2 and (f, g) electroetch F.
While the Kalling’s reagent number 2 (based on CuCl2 + HCl + ethanol) is known to be the microetchant for the Inconel 718 superalloy, it was found that it is also a suitable etchant for revealing the macrostructure of the alloy. The conventional macroetchant based on HNO3 + HCl + H2O2 was not as good as the Kalling’s reagent. By chemical etching based on HCL + HF + H2O2, the details of the dendritic structure can be revealed but the Laves phase is not discernible. In this case, revealing the Laves phase based on the backscatter electron images in SEM was also discussed. Chemical etching based on HCl + HF + HNO3 was found to be suitable to reveal the austenite/Laves eutectic unambiguously even in the optical images. Electroetching by a H2SO4 solution and by a solution containing HCl + HNO3 + glycerol were found to be appropriate for studying the as-cast and homogenized microstructures based on optical microscopy and scanning electron microscopy (SEM), respectively. If only revealing the Laves phase is intended, electroetching by as solution containing ZnCl2 + HCl + ethanol is appropriate both in optical micrographs and SEM images. During homogenization heat treatment, the dissolution of the Laves phase, coarsening of the grains and development of annealing twins were observed. It was also found that the optimized etching techniques can be also applied to the homogenized state.